Please join our affordable trek to the World' s Most Famous Mountain Everest base camp trekking Nepal !! *Walk amongst the highest mountains in the world. 77 years old Nepalese became the oldest climber of Mt.Everest : A Nepalese climber has become the oldest person to summit the world's highest mountain, breaking the previous record held by a Japanese man, officials said Sunday May 25th, 2008. The previous record was held by a retired Japanese school teacher Katsusuke Yanagisawa, 71, who conquered Everest last year 2007. Last week, 48-year-old Appa Sherpa broke his own world record by getting to the summit of Mount Everest for the 18th time. 3 . Nepal best Eco tourism Destinations in the world by Tourism market Trends. Mt. Everest - The home of the world famous friendly climber Sherpa people, Yak and Yeti's. Everest trek is our most popular and safe trek since last 5 years Our route Follows the footsteps of Sir Edmond Hillary and Tenzing Norgay as they approached Everest base camp over 50 years ago. We will travel through the homeland of the Sherpas, across high mountain passes and through valleys of the world's highest mountains. The same Everest Base Camp Trek we have for 18 days too, please contact us for details. The super view is included in your room price - no extra !! We have the following dates scheduled for this Everest base camp Trek 2011, that are guaranteed to operate with a minimum of 1 or 2 persons in the group. The trek is also available on a private basis to suit your own dates. Note : The Mani Rimdu Festival is a colourful, noisy occasion that takes place in the most spectacular of settings just below the most beautiful peak in the world Amadablam. Performed by the monks of Chiwong and Tengboche monasteries, it depicts the victory of Buddhism over the ancient 'Bon' religion. The festival lasts for three days and is well attended by the friendly Sherpa people who often trek for many days to witness this important event. Tengboche Mani Rimdu starts on the full moon of October, and the Chiwong Mani Rimdu on the full moon of November. We have two special departures to both festivals, the exact dates of which are yet to be announced by early Feb we will know once the Tibetan Lunar celendar is published. Please contact us if you are interested in these departures and we will confirm the dates as soon as they are known. On both Mani Rimdu departures we stay in comfortable mountain lodges it is called the tea house trek. It is either 10 days or 15 days trek. A Classic and Affordable Trek to Everest base camp - the World' s Most Famous Mountain, to climb the famous Kala Patar for fabulous Everest views. Please hear from our clients how much they enjoyed Everest trek with us , Few things speak louder and carry more meaning than first-hand experiences and personal testimony.. 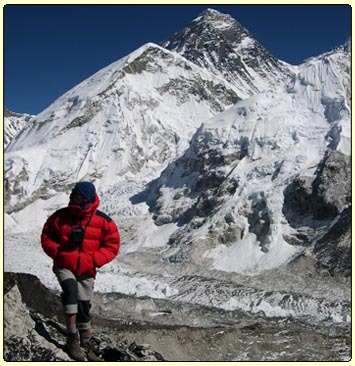 Bookings open for 2010 Everest Trekking. Please contact us for details! Every hiker’s dream is to stand face to face with Mt. Everest. - the tallest mountain on earth! Whether you call it Mt. Everest, Sagarmath or Chomolongma, the highest peak in the world, here in the far east northern corner of Nepal, is a stunning sight to behold as we follow in the footsteps of Tenzing Sherpa and Hillary who conquered the Everest first time and other great mountaineers. On this Everest base camp trek, your dreams will come true. Three of the highest peaks - Mt. Everest, Lhotse and Cho-Oyu guard this holy sanctuary of the Himalayan gods. Orange monasteries are bestowed with colorful prayer flags; carved prayer mani stones line the trails; and an unbending faith in traditional values embrace this Sherpa world. Climb Kalapathar (18,190’) for a stunning view of Everest and other major peaks. At the foot of Mount Everest, on its southern side, lies the Everest Base camp used by the successful 1953 expedition of Hilary and Tenzing and countless Everest expeditions ever since. Although situated in the heart of the Himalayas, at a height of 5600m metres (18,370ft), a trek to Everest Base camp is not the sole preserve of high altitude mountaineers. There are no rocky ridges to traverse, no scrambling or technical climbing, just a good well-graded path, accessible to all keen hikers and trekkers, which leads all the way to the foot of the world’s highest mountain. When choosing a trip to Everest Basecamp another factor to look for is whether you will actually reach Basecamp or instead, visit the nearby viewpoint peak of Kalar Pathar. Picture above is a view of Mt. Everest from the ridge of Kala Patar - You can stand here to see the Everest Mountain Panorama..- Top of the world! 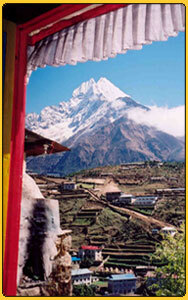 Kala Patar, rather than Everest Base camp itself, offers the best close-up views of Everest. As we appreciate that reaching Basecamp is the pinnacle for many trekkers and walkers, all of our Everest itineraries include both Basecamp and Kalar Pathar. Please join us on this 16-day, the most famous trek in the world ( Everest base camp trek) - a must do trek in your life time if you are outdoor lover. Arrival in Kathmandu Nepal, you will be met and assisted by Earthbound Expeditions representative and transferred to hotel which is located close to the tourist district of Thamel and offers comfortable accommodation. The first day may have been surprisingly long for some, but stay at Phakding allows us to begin the ascent to Namche Bazaar first thing in the morning. At about half-way up the hill, a gap in the trees allow us to spy Everest for the first time. If the weather is clear the top of the South-West Face will be just visible behind the long Lhotse-Nuptse ridge. A plume can often be seen stretching away from the very summit. From Namche we trek to Khumjung at the foot of sacred Khumbila peak (5,761m). Khumjung Gompa possesses what is said to be the skull of a yeti! Continue to Phunki and Tyangboche monastry for one of the most magnificent views in the world; an awe inspiring panorama of Himalayan giants: Kwangde, Tawache, Everest, Nuptse, Lhotse, Ama Dablam, Kategna and Thamserku. Cross the Imja Khola and continue through terraced fields and rolling pastures where yaks graze to Pangboche (3,860m). A long day and an early start. We trek along the rough path along the side of the Khumbu glacier to the tea shacks at Gorak Shep. Behind rises the attractive 7000m peak of Pumori which dwarfs our trek’s summit of Kala Pattar. The route up is straight forward and takes most people between 90 minutes and 2 hours. All the peaks - Everest, Lhotse, Nuptse, Changtse, Ama Dablam and scores of other lesser peaks can be seen from this wonderful vantage point. We back to Gorak Shep. A trip to the actual Base Camp of Mt. Everest. We continue our descent via Namche Bazar to Monjo. This Everest trek involves walking of 5 - 6 hours per day and covers an altitude ranging from MIN 1300 Mtr. to MAX 5500 mtr. The local flights is from Kathmandu to Lukla return. Special note: The safety and the well being of our groups are of paramount importance to us. All of our trips are led by qualified professional guides, who are well trained by Nepal Government. Our job is to ensure your comfort and safety as we take you where you want to go, because your holiday is ours. In this regard, we work honestly and effectively to provide you the Himalayan experience that suits your interest. We encourage you to question us freely and contribute in the planning stages of your adventure. When is the best season to trek in Nepal? Should I join with group for trek / tour? Can I extend my holiday in Nepal or some where else? Everest Trekking can be extend and there are many options and choices to extend your holiday before or after your main trip.You can even visit to India, Tibet or Bhutan or some Jungle safari in Chitwan national Park, rafting or go to some hill stations to relax or upgrade your hotels for one or 2 nights with Spa , Yoga or Golf. Contact us for extensions. We are located in north Thamel, same road as Kathmandu guest house, attached to hotel Buddha, Nepal. Nepal trekking Agency registered License number : 20 / 457. Book our safe trek and tours direct online and save!! A Nepalese trekking agency that is operated by Nepalese guides who ensure any funds are returned to it's people.